Make of this what you will, but tucked in the report on the future of the memory chips industry for mobile phones by the GF Securities brokerage, are some eye-watering revelations about the flagship phones we can expect next quarter, including the Galaxy S10 and S10+. China has been poaching star investment brokers from Taiwan for a while now, with the most notorious case being the famed Apple analyst Ming-Chi Kuo moving from KGI to TF Securities in China. GF Securities, however, also attracted a famous Apple supply chain reader on staff, Jeff Pu, so when GF sends a memo to clients, it rings rather credible. The memo in question includes a table that depicts the evolution of RAM amounts in popular flagships from this season and the near future. In it, not only do we learn that there might be top-shelf phones with 12GB RAM models next year, but that those could be of the Galaxy S10 and Huawei P30 series. 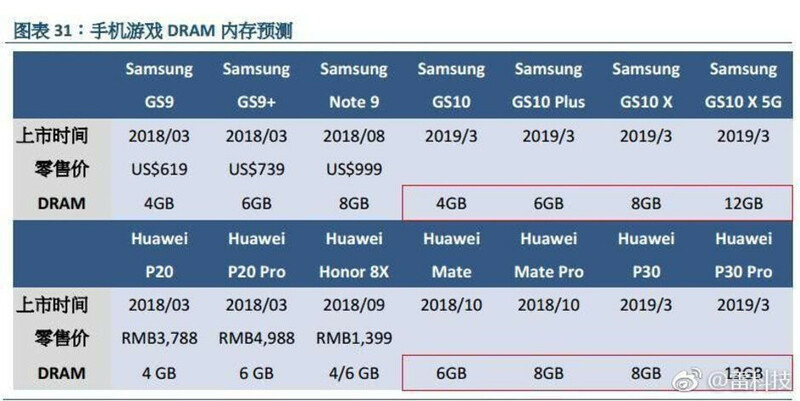 Yes, series, as the table depicts no less than three Galaxy S10 models plus a 5G version, just as rumored, called (perhaps as a placeholder) Galaxy S10, S10+, S10 X, and S10 X 5G. That same 5G model is listed with 12GB RAM, but the S10 X is no slouch with its purported 10 gigs, either. Xiaomi just announced a 10 GB RAM phone, the Mi Mix 3 "Forbidden City" Special Edition, but Samsung and Huawei (with an eventual P30 Pro) will apparently be pushing the RAM envelope further. Now, the basic S10 may evidently have "just" 4GB RAM, while the S10+ could come with 6GB. Just the top models of the world's first and third-largest phone makers are listed with as much RAM, and one of those units has 5G in the title, so perhaps manufacturers will be going all-out on their 5G models only, to justify their inevitably higher prices. 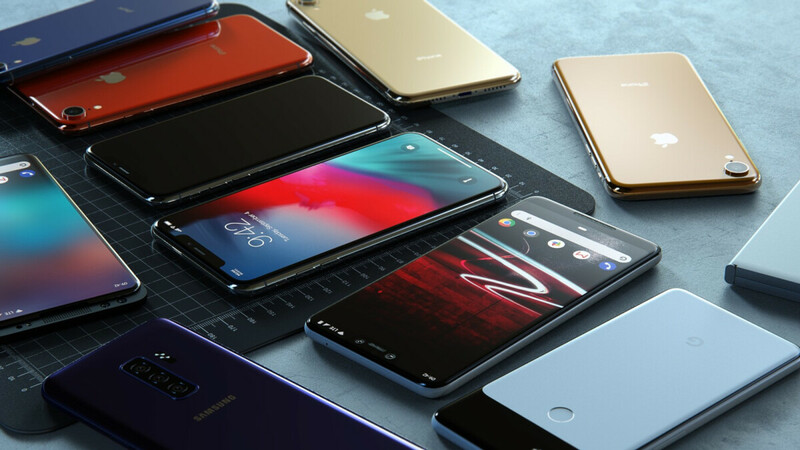 All in all, the year 2019 is shaping up to be one of the most exciting for the universe of mobile phones in recent memory. Sounds good, but i think the 5G 12GB model may only be available in china. 4 high end smartphone S10? Rly Samsung no 50 in next year in 03.2019? For now, the rumor is that it will initially be exclusive to South Korea, as they will have a nationwide 5G network up and running by that time. Get this guys...S9 only amount to less than 40 million units sold this year globally. Why is that? I predict that The best Flagship phone for this Year, Will it be Huawei mate 2 Pro. 4200mAh battery, Fast Charging, Super Memory, IP68 Standard, what else anyone wants From A phone? Value for money Flagship. Samsung Galaxy S9 It was a Big Disapoint. The same smartphone from 2016 and it was overpriced. The benefits of android, is healthy competition, you sont like a company or they are not living up to hype, u can jump ship, im dropping my note 8 for Huawei mate 20 pro, its by far the best phone of the year, hands down, its a bargain for all the tech inside and the freebies thrown in. Okay, so before I said 10 GB of RAM is overkill. I'm not taking back what I said. This is totally unnecessary. Next year will be big for Samsung. Even though the S10 will be great but the S9 and Note 9 prices will be way cheaper and people will still buy them. Their OS was smooth this year so it wouldn't hurt to get a S9 or Note 9. 12GB is fine, but it's solely a marketing bullet point. 4GB is becoming not enough. 6GB is the minimum that should be used on flagship devices. 8GB is good for future proofing. 12GB is just "cool story, bro". It would be hilarious if you found a new thing to comment about other than supposed "lag" issues. Wonder who your main account actually is since you just made this one last week. So is the Galaxy S10 X the fordable one?